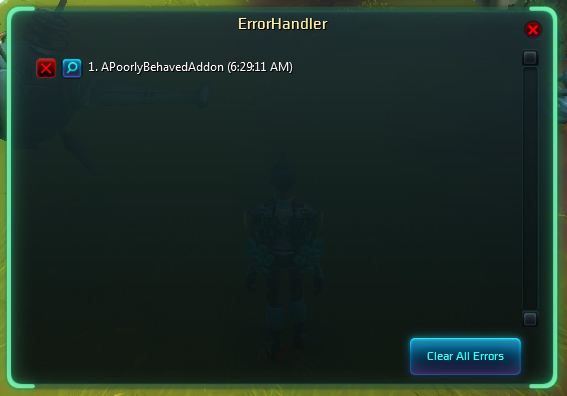 Sometimes you're doing important things in Wildstar, like trying to kill a spellslinger, and you don't want to be interrupted by a large window appearing on your screen saying that an Addon has done something silly. ErrorHandler prevents Carbine's error dialog from popping up when an addon or part of the Carbine UI encounters an error. If you click the magnifying glass next to an error, the ordinary Carbine error dialog will be shown. Click the X button to ignore an error and remove it from the window. I recommend pinning ErrorHandler to your menu bar. When any errors have occurred, the button will glow, and it will display the number of outstanding interface errors.